Juice drink with six fruits and vegetables and added magnesium. Tropicana's new range of Essentials juices is packed full of fruits, vitamins and veg - each flavour designed with your everyday health and wellness needs in mind. When life throws all it can at you, it can be difficult to stifle the yawns. 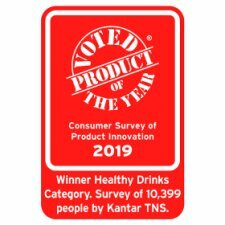 Vitality is bursting with the ideal taste of fruit and vegetables with vitamin C and added magnesium which contribute to the reduction of tiredness and fatigue. Vitality helps maintain your health as part of a varied, balanced diet and a healthy lifestyle. A 150 ml serving size of Essentials Vitality counts as one of your five daily fruit and vegetables. All that and no added sugar. When you listen to your body what does it say to you? Need some harmony? Have you tried Tropicana Essentials Inner Balance? 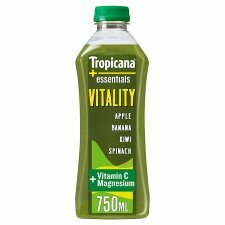 It's another of the great tasting juices in the Tropicana Essentials range. The full range of Tropicana Essentials juice includes Vitality, Berry Boost, Vitamin Power & Inner Balance. Keep refrigerated and consume within 5 days of opening., For best before, see bottle. Separation is natural. Shake well before serving.